The Best Plants for Landscaping in the NJ Tri-State Area You can walk into any home and garden shop and be overwhelmed by the choices available to you. While most everything you see is a beautiful option, not everything may be ideal for your yard, soil type, and exposure. That’s why it’s helpful to trust experts to help you make the best choices for your landscape plantings. Thomas Flint Landscape knows proper plant selection is key for landscape plantings in the New Jersey tri-state area. When we work on a landscape design for your home, you can rest assured that the plants, flowers, shrubs, and trees we recommend for your yard will flourish in your unique exposure. Our objective is to create a landscape which compliments your home by adding visual interest during all the seasons of the year and stages of growth (trees, shrubs, perennials, and ground covers). A couple of great plant suggestions for landscaping in the NJ tri-state area include the flowering dogwood tree and the common violet. A flowering dogwood tree is a great option, considering they are native to the forests of New Jersey. These can serve as a beautiful ornamental tree with small white or pink flowers in the spring, and rich red and purple leaves in the fall. 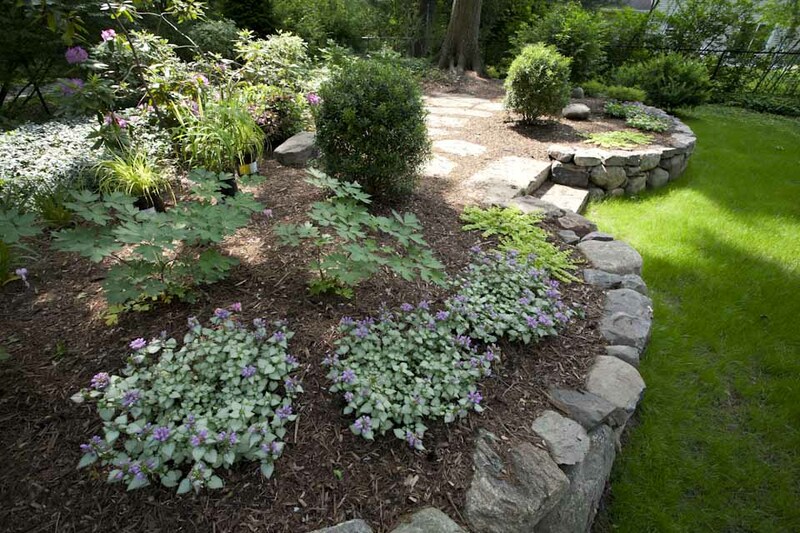 The common violet (which also happens to be the state flower of New Jersey) is a perennial flower that works great as ground cover in a garden. The team at Thomas Flint Landscape will recommend trees and flowers that are the right fit for your yard and landscaping needs. Whether you want a bright and beautiful garden in your back yard, or you need more curb appeal added to your front yard, Thomas Flint Landscape can create the perfect NJ tri-state area landscape design that incorporates the colors and textures that complement your home, while choosing the appropriate plants that will thrive in your yard. When it comes to landscape planting design, we believe in using as many native plants as possible to create and sustain a healthy ecosystem. A well-balanced planting that incorporates native species as well as the proper plants for your soil type and exposure will produce a thriving, beautiful landscape for years to come. A good landscape design will not just look good the day after it is installed, but will continue to look better each and every year. Thomas Flint Landscape Design & Development is a Ramsey, New Jersey landscape company that specializes in landscape design, planting, outdoor lighting, paver patios and walkways, outdoor fireplaces, and more for people in the New Jersey tri-state area, including New York and Connecticut.